WAT Topics: It is necessary to have good knowledge about the latest WAT topics making round in IIMs to be able to add value on content. WAT Tips: Before getting ready to start writing on WAT topic, you must know how to start writing, add value to your short written piece of 200-300 words, and how to sum up as it becomes the source of PI questions also. Top WAT Topics making round in IIMs: Recent policy announcement, current affairs, Business & Economy, Social Issues, Abstract topics figure in WAT round of IIMs, for example Demonetization, GST, Budget, Govt Initiatives, Bank Merger, Bank Recapitalization among others. MBAUniverse.com has prepared summary of key facts and information needed for Top WAT Topics. Read below the solved WAT topic and prepare your content based on the information. 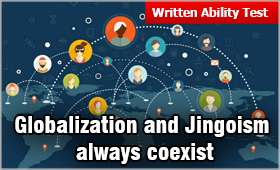 Latest WAT topic which is making rounds in IIMs’ WAT and appeared in XAT also is ‘Globalization and Jingoism always coexist.’ Although it appears an abstract Essay topic, in fact it is a current affairs topic for WAT. The importance of this WAT topic in 2018 can be understood by the fact that it has gained international relevance post the United States’ President elections. The move of Globalization has been viewed as the step taken to bring the world closer, get the benefits of advanced economies, make the economy of the home country grow on the lines of Global growth, know and spread the culture of one another. However, since Globalization without the touch and feel of domestic requirements will lose the relevance at national level, both the concepts have coexisted and will continue to co-exist. The last decade of 20th century began with the concept of Globalization especially the developing economies taking steps to leap from Jingoism – the too aggressive protectionism at national level to spread wings in order to reap benefits of competitive Global markets. Globalization is the new name for Laissez-faire – a French term that came up in 17th century calling for minimum Government intervention and allowing free movement of goods and services offering healthy competition to the local economy to enable it to improve its quality and standard. Given the fact that many countries which remained under the control of foreign powers for hundreds of years and could not compete Globally after they were freed and apart from the moving on the path of growth in accordance with Global trends, they had to protect their home industries by imposing import restrictions, high tariffs, custom restrictions, quotas on certain imported goods to protect and enable home industries to grow. To inculcate the feeling of nationalism the use of domestic made products has been promoted. Thus, the Globalization with Jingoism has continued to co-exist for centuries to help the under developed countries to become developed and become one of the strong economies with high per capita income in the world. Earlier the developed economies like United Kingdom, United States of America and other countries also aggressively practiced Globalization with jingoism but placed no tough restriction on employment to the skilled technical personnel and other human resources coming for employment from other countries. The outsourcing of services in low per capita income countries was also freely permitted to increase profit margin in home countries. No restriction on imports, exports of goods and services by the developed countries like USA was imposed earlier. Quite recently, Jingoism-the national patriotism to somewhat extreme level has again started overpowering the Globalization even in developed countries. This could also result in isolation due to too much protectionism. Recently elected President of America Mr Donald Trump has fuelled the Jingoism more while announcing number of restrictions on free import of various goods, issuing the Visa to foreign nationals and foreign skilled professionals coming for employment in USA. USA has recently announced a hefty increase in import tariff on Aluminium and steel. The Jingoist action has been criticized by Europe, China and World Trade Organization alike and is viewed as a step to stop spread of Globalization. Any counter reaction by Europe on other imports from USA may become a deterrent on spread of Global Trade that could become prosperity. Similarly, the President of USA has put the arrival of professionals from certain Islamic countries under a tough scan by announcing certain restrictions. This has irked the targeted Islamic countries. But on the similar grounds US President has also announced liberal aids to many countries and has stopped the major chunk of aid to the countries like Pakistan who give shelter to the terrorists. This move is appreciated worldwide as the spread of Global Trade is not possible without elimination of fear of terrorism. Brexit is another example of Jingoism to protect home economy against Globalization. Brexit refers to the Britain moving out of the European Union with the objective to put a check on immigration by tightening its visa norms deviating from the European Union norms. Internet, Social media, easy Global movements, have made it easier to get in touch any part of the world, buy any product from any part of the world, move and set up a business abroad. This has given rise to Global networking and views are instantly expressed on any Global happening or event. It has also become possible to promote the native product, culture and make it more prominent while competing with cultures and practices of other countries. It however depends how well both are practiced and not taken to either of the two extremes on Globalization or Jingoism. Countries are opening up now. More people study and search for employment in foreign countries than earlier. Many of them migrate to other countries for good and settle there. This has given rise to the fear among the natives that their jobs might be taken away as people are coming at lower remuneration, outsourcing by industries in low cost countries could result in loss of employment in home country and so on. However, since it is the Globalization that is spreading business, it is very much possible that with the expansion of trade, home country will reap more benefits resulting in more employment for natives in the expansion phase. The fear of losing the native culture, indigenous arts, cottage industry among others also give rise to Jingoism, making it a hindrance in spread of Globalization. Thus, with the greater Globalization, more fear of loss will be there giving rise to more Jingoism. Hence, both will coexist unless the countries become confined to isolated homes without making any Global trade which is not possible for the future of world economy. The need is however to keep a balance between the Jingoism-Nationalism and Globalization.